Definition: Strategic Business Unit (SBU) implies an independently managed division of a large company, having its own vision, mission and objectives, whose planning is done separately from other businesses of the company. The vision, mission and objectives of the division are both distinct from the parent enterprise and elemental to the long-term performance of the enterprise. Simply put, an SBU is a cluster of associated businesses which are responsible for its combined planning treatment, i.e. the company engaged in a diversified range of businesses, categorises its multitude of businesses into a few separate divisions, in a scientific way. The task may include analysis and bifurcation of a variety of businesses. It can be a business division, a product line of the division or even a specific product/brand, targeting a particular group of customers or a geographical location. Separate business or a grouping of similar businesses, offering scope for autonomous planning. A manager who is accountable for strategic planning, profitability and performance of the division. A strategic business unit is specially formed to target a particular market segment, which requires expertise in production or management, not present in the parent company. The structure of SBU consist of operating units; wherein the units serve as an autonomous business. The top corporate officer assigns the responsibility of the business to the managers, for the regular operations and business unit strategy. So, the corporate officer is accountable for the formulation and implementation of the comprehensive strategy and administers the SBU by way of strategic and financial controls. In this way, the structure combines related divisions of business into the strategic business unit and the senior executive is empowered for taking decisions for each unit. The senior executive works under the supervision of a chief executive officer. 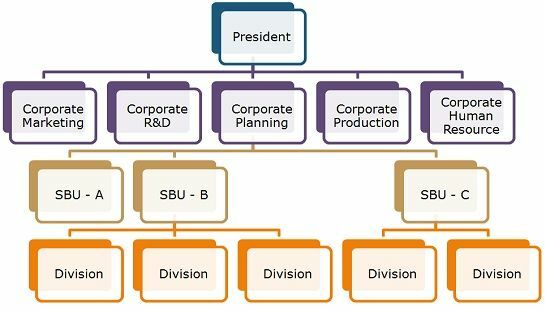 There are three levels in a strategic business unit, wherein the corporate headquarters remain at the top, SBU’s in the middle and divisions clustered by similarity, within each SBU, remain at the bottom. Hence, the divisions within the SBU are associated with each other, and the SBU groups are independent of each other. From the strategic viewpoint, each SBU is an independent business. A single strategic business unit is considered as a profit centre and governed by the corporate officers. It stresses over strategic planning instead of operational control so that the separate divisions of the SBU can respond as fast as they can, to the changing business environment.